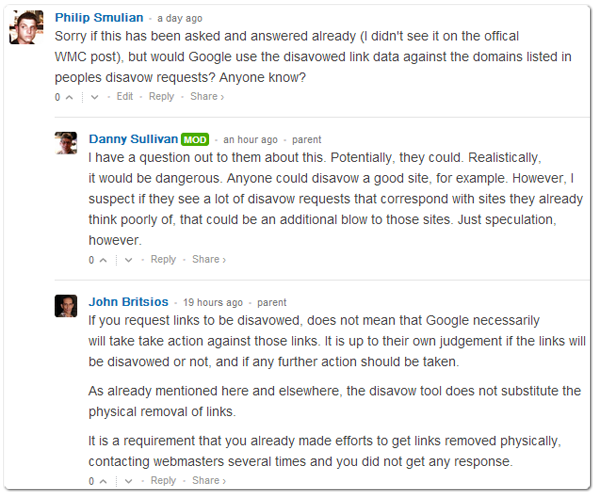 Thought leader Danny Sullivan wrote on Google’s newly launched link disavow tool – which allows webmasters to disenfranchise specific links, or domains that link to their websites – a response to the wide demand for a way for the average Joe Bloggs (no pun intended) to recover from April’s Penguin update. Danny’s post has the detail. Some deemed this a poor spend for their optimization time, vs. producing good content for example, while others considered it a saving against having to manually request hundreds to thousands of link removals. Plenty debate therein about negative SEO and plenty Google slandering, some saying that Google should ignore backlinks rather than penalize them. Indeed Danny – Anyone could disavow a good site. We can only disavow sites that link to ours, so it’s not as open to mass competitive assault. Google loves feedback data. I don’t see why they wouldn’t match these results with other negative traits of a site. They want as clean an index as is possible. I too can only speculate, unfortunately, but I do feel Google is on a mission of this ilk. @ John Britsios, it IS up to their own judgment. 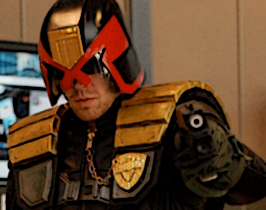 And to quote the 2012 Dredd film: “It’s Judgment time”. Yes I’m sure of all the readers and commenters, there are the two notable divisions: those that have been penalized because of poor quality links, outright spam links or simply a lack of links, and those that have evaded the Penguin and wish to focus on constructive, rather than rehabilitative efforts in the future. To the former: too bad for you. To the latter: congratulations and please feel free to divulge your best kept secrets in the comments below.